In my study of scented raw materials, readings from several ancient books (Teofrastus, Dioscorides, Pliny) on the origin of the perfumery practice in ancient times had stirred upd me to deepen the technical aspects of both the obtaining of scented material and the plants from were they was obtained. Techniques based mainly on wine, oil and animal fat maceration allow to obtain several scented materials that, alone or mixed were used as body scent, ambient scenting and in cosmetic preparation. 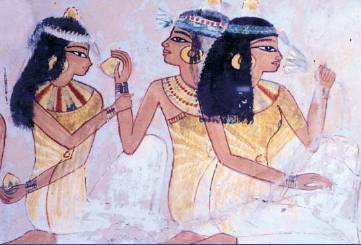 One of the old civilization that for sure excel in the use of essences was Old Egypt. Natural substances handling masters, of which the mummification process is the well-most known application, old egyptians made accurate recipes and procedures for obtaining several scented unguents, fats and incense. 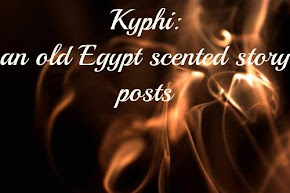 Through all, Kiphy is the most famous scented product, often covered by a mistery aura on the caused effects. Kiphy bring us back to times where temples were full of scents, the gods statues speaded and rubbed e by heavy charged essence’s unguents, all this in an atmosphere able to let the gods’s direct communication by the priests. Latin translation from old Greek, kiphy word comes from old egyptian Kapet that means any material used for temple fumigation: kiphy so was not an scented unguent used for scenting the body as often written, but an incense burned in sacred temples; it is known a medical use too, but here i will refere only on its use as swiffy scented vector. As reported by the old greek writer and traveller Plutarch that visit Egypt in the 2nd century BC, in the temples dedicated to the god of Sun Re, 3 type of incenses was burned during the day: Frankincense in the morning, Mirrha at noon and Kiphy at evening. Otherwise from the first 2, it was not a direct natural product (frankincense and mirrha comes out directly from Boswellia and Commiphora shrub and trees) but a mixed material (an incense exactly) obtained mixing together resins, herbs, liquids by a precise procedure. Kiphy, or better its scent, had an effect that today we call aromatheurapetic; old egyptians for sure knew the beneficial effects of naturals. Several recipe for kiphy making are known, given by several old writers, different for number and quality of raw materials used, as well as for its preparation method. the majority of them arrived to us from old greek writers(Damocrates, Dioscoride, Plutarch) but there is a version that is written, carved on the EDFU and PHILAE temple walls where al the unguents and incense were made and used there. 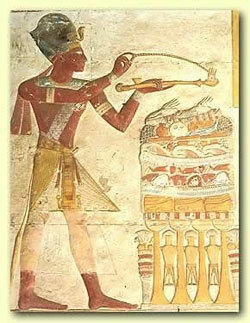 Kiphy was so important that the raw materials and the making recipe necessary to made it were immortalized on the walls of the rooms of the so-called “laboratory”, to be delivered to eternity. Being a purist, lover of the original and authentic things, i will write just about this versions of kiphy making, for me sure coming by an “old egyptian hand”!! Was sixteen the required ingredients to kiphy making: 7 types of resins, 3 types of ryzome/roots, 2 types of seed/herbs, 2 types of wine, 1 type of dried fruits, honey. The making and the adding of the ingredients followed a recipe that rule the milling of the herbs and resin and their following maceration in the wines and honey, to their mixing and controlled concetration. Next time i will go inside the raw materials used and talk deeper about the making recipe of this “magical” material. For those who wants to read more, there is the bibliography i collect and used to write on the subject.